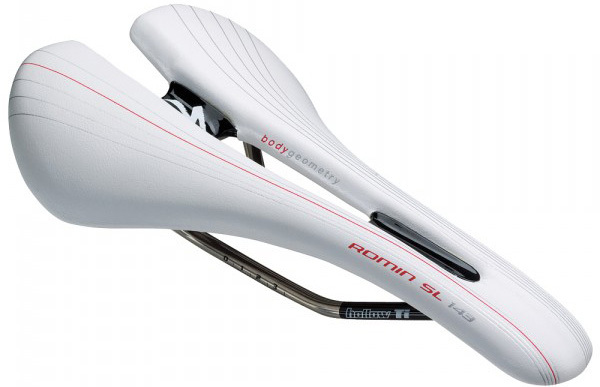 I’d heard rider after ride rave about the Romin. So, I had to try it. I was looking for a replacement for my San Marco SKN. At first glance I really liked the look of the saddle. Really well made, slick, nice colors/graphics, really everything about the appearance is nice. Once installed, it felt great at first. Such a difference from the SKN. The sloping middle cradles your posterior just right and I thought I’d found my new saddle. Until I rode it…. At one point I put it back on eBay because I was convinced I’d never get used to it. It just felt…hard. My sit bones would be so uncomfortable after 30 mins. Something wasn’t right. I switched it out for a Selle Italia SLR which I did a 65 mile ride on. It felt better but again, not my kind of saddle. I put the Romin back on…and wow, comfort again! But, ensuing rides proved that I hadn’t figured this one out. So I tried every angle from back to forward, slid the saddle up, slid it back and nothing was working. Finally, just yesterday I dropped my seat height 2mm., tilted the saddle more nose down than i had done before, slide it rearward about 1mm or so…and boom!!! That was it. I found it. The setup. Went out for 25 miles to test it and I was happy. No more searing sitbones. In the end I think the saddle was a bit high and I’d had it tilted back just a bit much. Padding could be cushier…personal preference. It took me many tries to get the setup right. But I think I did it. Older Specialized Rival, San Marco SKN, cheapo Sette model way back when. Reviews by community members are the foundation of RoadBikeReview.com. Share your experience with other cyclists by writing reviews for your bikes, gear, and other related accessories. You don’t have to be an expert – everyone’s opinion counts. I concur it’s a very comfy saddle tho, either sitting at the ‘back’, or up on the nose, like in crits.